Remember how that frog from Looney Tunes would sing "Hello My Baby" while strutting around with his top hat and cane? Well, that’s what I’m doing right now in my mind. 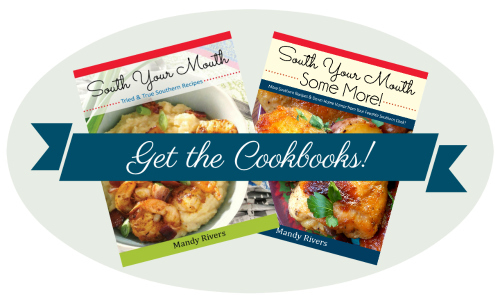 Because, I've been looking forward to giving you this recipe for years! And I finally made it this weekend! And I literally (yep, literally) strutted around my kitchen this weekend singing like that frog at the top of my lungs when I served this. I’m pretty sure Husband thinks I've finally cracked my nut. My mom’s friend, Suzy, gave us this recipe forever ago and it is the single best cheesecake recipe I've ever made. EVER. Suzy calls it Awesome Cheesecake and that, it is, but I’m going to call it Perfect Cheesecake because, well, it’s perfect! I like to make it with a gingersnap crust made from store-bought gingersnaps (or these homemade gingerbread cookies would be amazing too!) but if that’s not your thing, feel free to substitute graham crackers. Break gingersnaps by hand then add to a food processor. Pulse broken cookies into crumbs and until no chunks remain. I used about a half of an 18-oz. bag to yield 2 cups. Combine gingersnap crumbs and sugar in a medium-size bowl then add melted butter; mix well. Press crumb mixture on the bottom and about an inch and a half up the sides of a 10-inch springform pan. Bake at 350 degrees for 10 minutes then cool crust completely. Beat cream cheese, lemon juice and vanilla in a large bowl or stand mixer at medium speed until smooth and creamy (use the whisk attachment if using a stand mixer). Add eggs, one at a time and continue mixing until well combined. Scrape down sides of the bowl. Add sugar and flour and continue mixing at low speed for five minutes, scraping down sides of bowl periodically as needed. Add whipping cream and mix just until filling is smooth and creamy. Pour filling into prepared crust. Set oven rack to the middle position in your oven. Preheat oven to 350 degrees. Wrap the bottom half of the springform pan in aluminum foil then set the pan in a large baking dish. Fill the baking dish with enough HOT tap water to cover the bottom of the springform pan by about an inch. The foil is just to prevent any water from seeping into the springform pan and into the cheesecake. Bake at 350 degrees for 1 hour and 15 minutes or until edges are light golden brown and set and the filling no longer jiggles. RECIPE 911: If you overcook your cheesecake and it cracks or just isn't pretty on top, mix together 1/2 cup sour cream and 1 teaspoon sugar (or to taste) until smooth. Spread sour cream mixture on top of cheesecake. Boom. Crisis averted. Remove cheesecake from oven and let cool to room temperature. Once cool, cover with plastic wrap or aluminum foil (or place in an airtight container) and refrigerate for at least 6 hours. Serve plain or with chocolate sauce, cherry pie filling, lemon curd, fresh fruit or whatever else suits your fancy. I was fancying some cherries so that’s what I used! Cheesecake is one of my all time favorite desserts. I've got a couple of good recipes in my arsenal, but I'll have to give this one a try, too. Thanks for sharing! You lost me with the gingersnap crust. In my opinion, it does not go with cheesecake. You got to be kidding. gingersnap with cheesecake? We heard you the first time! We just were not interested, because we didn't agree! If you don't like it, don't make it! So I guess you don't believe in flavored cheesecakes either??? I think Gingersnap crust would be AWESOME with a Pumpkin Cheesecake. I've made it, and it's awesome. We happen to LOVE cheesecake in my house. We're always happy to try any and all kinds and this one will be added to my list of "must-make" and soon. 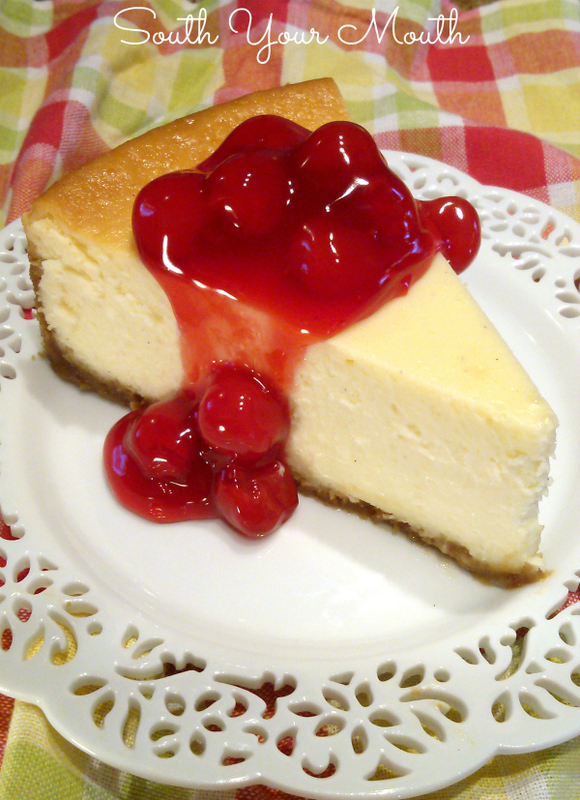 Always nice to have a different cheesecake recipe, keeps our taste buds happy! I think the gingersnaps are, well, perfect! Don't knock it until you try it :o) When I make a chocolate version of this I use chocolate wafers and they're amazing too! I absolutely LOVE a good cheesecake. I cannot wait to give this a try. Suddenly I really want a piece of cheesecake!! I will be making this cheesecake however I will be using granulated Splenda and omitting the crust to keep the carbs lower! I've done just that and it works perfect! I've also made a "meal" from almonds in the food processor and mixed it with melted butter and brown sugar splenda to make a crust. It doesn't completely firm up like a crust but it works good enough for me! Oh no! Was it overcooked inside? 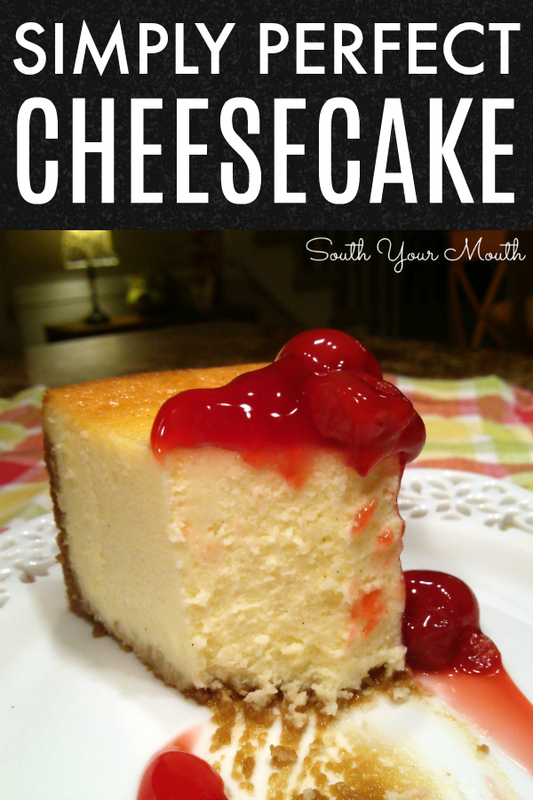 Mandy...I have made this cheesecake on a couple of occasions for my family and it is absolutely the BOMB! My 11 yr old nephew called and told me all he wanted for his birthday was my cheesecake. how would vanilla beans work to replace the extract? If water accidently gets inside the aluminum foil does that mean it's ruined. Or can it still be saved?? Also is it necessary to bake it in a water bath or could you bake without? Sorry first time making cheese cake here. Just a little water should be OK... the pan is somewhat sealed. If you're nervous about it, place the cheesecake on your center rack then place a 13x9 dish of water underneath it on a lower rack. The water bath really just helps prevent the top from cracking or the cheesecake to turn out dry.